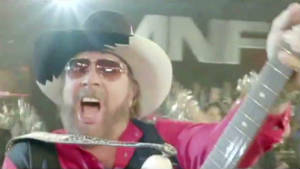 CNN) — Hank Williams Jr. apologized Tuesday for comparing President Obama to Adolf Hitler, a remark that prompted controversy and resulted in “Monday Night Football” pulling his popular musical introduction from this week’s game. “I have always been very passionate about politics and sports and this time it got the best or worst of me,” the country singer said in a statement. “The thought of the leaders of both parties jukin’ [sic] and high fiven’ [sic] on a golf course, while so many families are struggling to get by, simply made me boil over and make a dumb statement, and I am very sorry if it offended anyone. I would like to thank all my supporters. This was not written by some publicist,” Williams wrote. Williams made the comparison on Fox News this week when he was asked about Obama and House Speaker John Boehner, a Republican, playing on the same team in a June golf game. “The Holocaust was a singular event in human history, and it is an insult to the memory of the millions who died as a result of Hitler’s plan of mass extermination to compare the Nazi dictator to any American president,” said Abraham H. Foxman, ADL national director and a Holocaust survivor. “Hank Williams Jr. should know better. He owes an apology to Holocaust survivors, their families, and the brave American soldiers who gave of themselves to fight the Nazi menace during World War II. The last thing we need is to enter another election cycle on a sour note tainted with inappropriate, tired and over-the-top analogies to the Nazis,” he said. “ESPN responded appropriately and did the right thing in pulling the Hank Williams Jr. football song from the airwaves,” Foxman said. On Tuesday, ESPN said it had made no decision on Williams’ future beyond the Monday night telecast, according to Bill Hofheimer, senior director of communications at ESPN. Williams has criticized Obama in the past, when the Democrat was running for the presidency. In 2008, Williams was even mentioned in some media outlets as saying he was considering running for the U.S. Senate as a Republican in the next election cycle, but those plans never materialized. Williams, who supported the Republican ticket in 2008 and even penned a song called “McCain-Palin Tradition,” said during that campaign that candidate Obama didn’t like the national anthem. The day before voting in the 2008 election, Williams said: “You know, I’m usually at Monday Night Football tonight, but Colorado, this is a lot more important tonight. Join me now in our national — you know, that song that, uh, Mr. Obama’s not real crazy about, we’re singing it right now.” Williams then performed his version of the anthem. Thompson, an actor and ABC Radio Network commentator, was a Republican senator from Tennessee and one-time candidate for the Republican presidential nomination. In Nashville, Tennessee, the Country Music Hall of Fame and Museum said the controversy won’t affect its ongoing exhibit of “Family Tradition: The Williams Family Legacy,” a 5,000-square-foot display about Williams and his family, including his father, an iconic country singer himself, spokeswoman Tina Wright said.